I grew up with the Berenstain Bears. I had a ton of the books, and I can remember the TV specials. I loved those books and shows. I still do! I get to relive that part of my childhood with my kids – they too have a ton of the books and quite a few Berenstain Bears DVDs. I’m happy to say we’ve been able to expand our Berenstain Bears DVD collection courtesy of kaboom! entertainment. I received two great new Berenstain Bears kits for review, along with two great Berenstain Bears books. The kits are special editions that are now available exclusively at Walmart and Sam’s Clubs stores in the US. 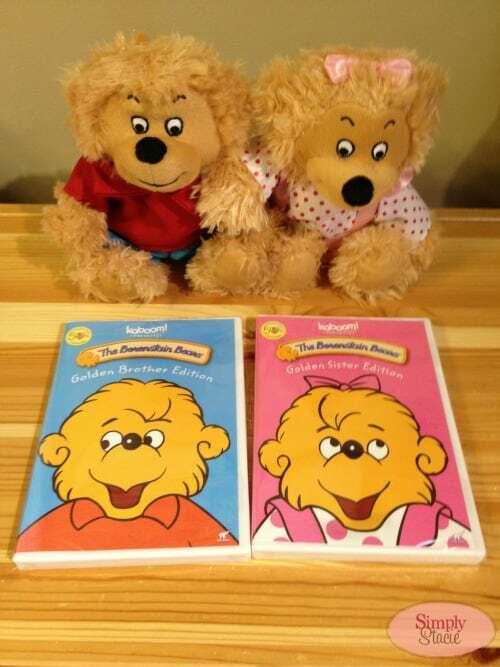 The Berenstain Bears: Golden Sister Edition includes a wonderful stuffed plush sister bear along with a DVD with episodes that revolve around sister bear. The Berenstain Bears: Golden Brother Edition includes a cuddly brother bear plush and as well a DVD featuring brother bear episodes. Both DVDs run about two hours each, so they’re great for movie nights with the kiddos, or long rainy days in the house. 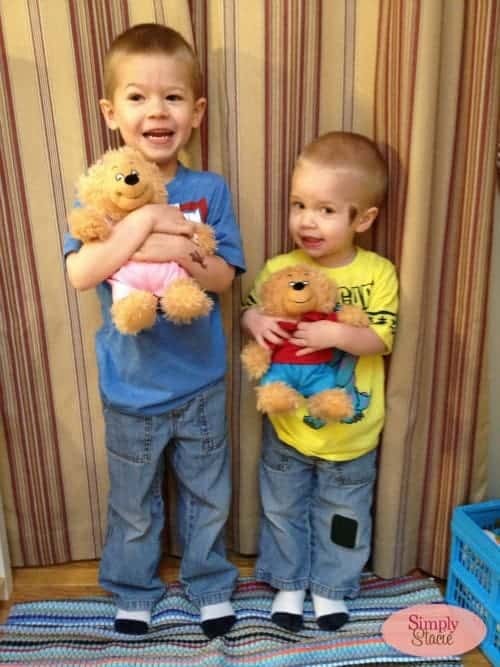 My boys love the stuffed brother and sister bears and insist on taking them to bed at night. It warms my heart that they’ve fallen in love with the Berenstain Bears the same way I did as a child. I enjoyed watching the DVDs with my sons – especially now that I pick up on all the cute little adult references that I’m sure went over my head as a child, like the Lazy Bear Recliner that papa wants and the Bear-bie dolls that sister plays with. The wonderful thing about the Berenstain Bears series of books and DVDs is that they are true family-friendly entertainment. Each episode features timeless life lessons and traditional community values. You can also feel good about turning on these DVDs without having to worry about inappropriate language or violence. Both special edition DVD sets sell for $19.99 at Sam’s and Walmart. These sets would make wonderful gifts for any young child in your life. To see the full line of kaboom! entertainment titles available, visit their website. You can also find them on Facebook, Twitter, and Pinterest. Awe cute pictures. I remember Berenstain Bears as a kid, we had almost all of the books. I enjoy reading them now to my kids. I used to love the Berenstain Bears and I still do… Oh yah, and so do my boys! Love the Berenstain Bears – I always have. My kids swear I had to go buy a book every time I found a new one in the bookstore. My kids grew up on stories of Bear Country. Cute tales and characters that deliver a good message. I am now trying to pass that along to my grand kids so I am happy to see that they are still around for the next generation. The Berenstain Bears are wonderful, the show always gives great life lesson for the children. My kids loved them I can say they didn’t miss many episodes. My little niece and nephews are now fans, last Christmas they got 2 DVDs in their Christmas stockings. I used to love the Berenstain Bears, haven’t seen much of them around for a bit. Will have to check these products out for my niece would love to get her one of the kits. Berenstain Bears are great. use to read them to my kids and have read them to the grandkids. I loved the Berenstain Bears growing and now so do my kids. These packs would be great gifts! I read all the Berenstain Bears books to my daughter. I loved them as much as she did! My son loved those books when he was an early reader, and I enjoyed them with him. They’re not like the books you get tired of reading over and over again. The cartoons are great, and I wish more kid’s stuff was like that, values but still fun. My son is 11 now and every year we go through the books for donations, the Berenstain Bears make the Keep pile each year. I remember reading their books to my son some 20 years ago. These limited edition sets are so cute. We never had the stuffed animals. I sure hope I can afford to get them for my great-niece before they are gone!